There’s something so appealing about the idea of a superfood – a single food item that will give us everything we need to stay healthy. But as useful as they are, man (or even woman!) does not live by superfoods alone and it’s an overall healthy diet that holds the key greater overall health. Even better, by paying attention to food synergy – the way everyday foods can combine to become ‘superfoods’ you can make your diet more interesting to eat, and better for you as well. When you hear phrases like ‘food synergy’ it may sound like just a lot of new age nonsense. But there’s more and more evidence that certain components in the foods and beverages we consume (like minerals, vitamins and phytochemicals, fibre, and fats) interact with each other to give our bodies extra disease protection and a higher level of health. Likewise certain foods simply bring out the best in each other nutritionally. A good example of this is tomatoes and olive oil. Around 98% of the antioxidant flavonols in tomatoes is found in the tomato skin, along with great amounts of carotenoids like beta carotene and lycopene. So the first thing you need to do is keep the skin on your tomatoes. The next thing you need to do is to ensure you eat or cook them with a healthy oil such as olive oil. That’s because carotenoids are fat soluble. That means your body absorbs more of in the presence of a little fat or oil. If you cook your tomatoes rather than eating them raw the lycopene content increases by 5-6 times. Other good examples of food synergy include using herbal marinades on red meats before you cook them. Herbs like rosemary have powerful antioxidants in them that help neutralise some of the free radicals that can form when meat is cooked at high temperatures. Scientists speculate that these free radicals called heterocyclic amines may be one of the reasons why high meat diets are linked to cancer. Another good combination is green tea and lemon. The vitamin C in the lemon can boost your body’s ability to absorb the antioxidant catechins that are so abundant in green tea. If you mix turmeric with black pepper, substances in the black pepper will help your body absorb more curcumin the active ingredient in turmeric. Both black pepper and turmeric are potent anti-inflammatories. We need more of these in our diets because inflammation is at the root of many modern diseases including heart disease, diabetes, cancer and dementia. One of the reasons why you might traditionally see combinations like pork and sauerkraut is that fermented vegetables boost levels of gut friendly bacteria. This means a better digestion and also better immunity. In fact as a general rule is easier to digests meat if you eat with non-starchy vegetables my green beans, kale and spinach. In our book Healing Foods we paid particular attention to food synergy to make sure every recipe packed a nutritional and medicinal punch. This hummus with coriander dip contains bone healthy minerals. Get the recipe for thi,s and the other foods in this article, by clicking the links opposite. For instance there’s Ezze which is a kind pungent Bhutanese salsa or relish. It’s a combination of chilies, onions, garlic, coriander and tomatoes with that all important olive oil to help bolster digestion and stimulate circulation as well as improve immunity. 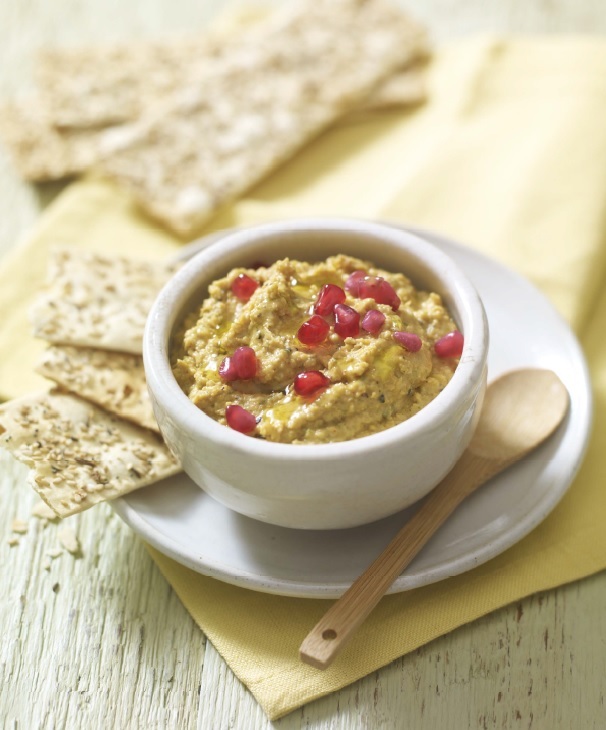 Our Hummus with Coriander dip is made from chickpeas, which are rich in bone healthy minerals like calcium phosphorus and magnesium. Chickpeas are also a source of vitamin B6. Try this dip with some leafy magnesium-rich greens such as spinach, chard, kale or beet greens and the B6 will maximise the absorption of the calcium. Doping that would benefit your emotions too since many of us are low in magnesium, a mineral essential in helping to balance our moods. The Aubergine (or Eggplant) Dip – similar to baba ganoush – is great for detox thanks to the combination of dietary fibre in the aubergine and the antioxidant capacity of the other ingredients such as cloves, chilli and onion. 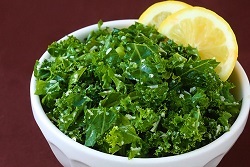 With our Kale Crisps the lemon juice that you soak them in first is rich in vitamin C that helps to enhance the bioavailability of the kale’s phytonutrients, particularly its iron. But you can get a similar benefit by squeezing a bit of citrus juice on your spinach. Even some of the most ordinary foods have remarkable nutritional properties. Often it’s how we prepare them, the form that we eat them in (whether they are fresh or processed) and how we combine them that makes the difference. The concept of food synergy is more than just a fad. It encourages us to be more adventurous in our cooking and can also help us build healthy eating habits that will sustain us over the longer-term. 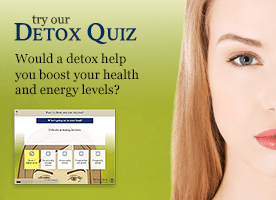 See also on this site: Astragalus and Schisandra Broth, Quinoa and Vegetable Stack, Kimchi and Cooking with Medicinal Herbs also taken from Neal’s Yard Remedies Healing Foods – Eat Your Way to a Healthier Life. What makes a ‘powerhouse’ vegetable?